BEST SELLER. Durable, rigid polypropylene front cover and sturdy board back to allow easy drawing anywhere, anytime. 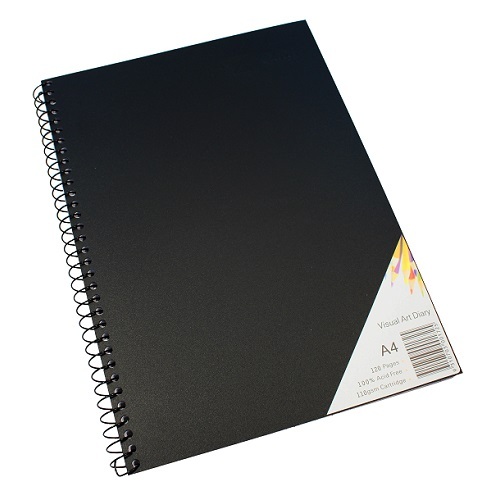 Complete with 120 pages of 110 gsm acid free cartridge paper for the best quality work and superior results. 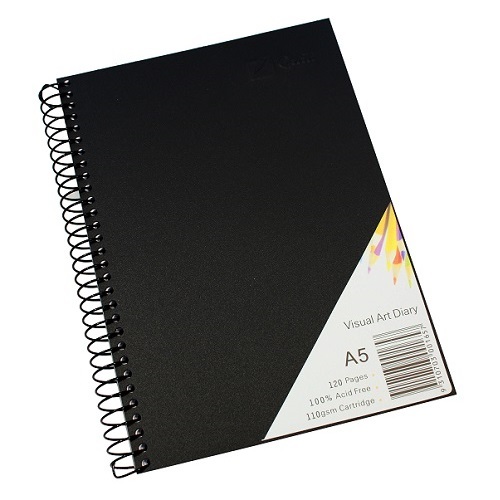 Spiral bound to allow book to be opened flat or fold back to 360 degrees for convenient jotting and drawing. Stands up to frequent use. 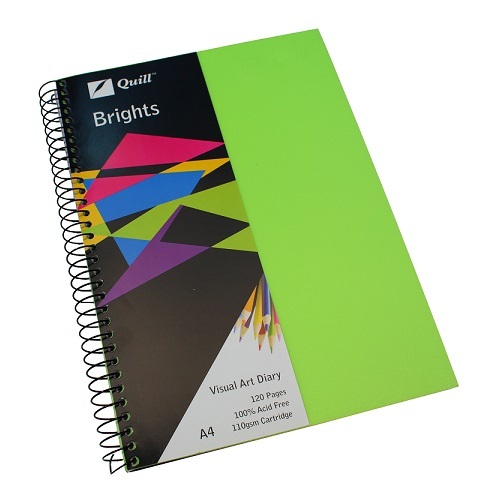 Visual art diaries are an essential item for all artists - professional and students alike - now with colourful bright covers. Durable, rigid polypropylene front cover and sturdy back board. 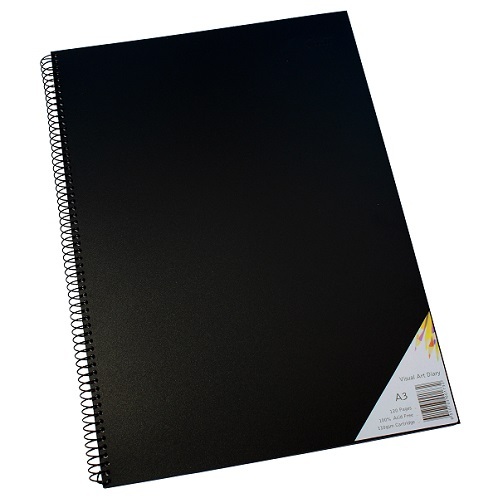 Spiral bound diary with 120 pages of acid free 110 gsm cartridge paper for superior results. Durable, rigid polypropylene front cover and sturdy board back to allow easy drawing anywhere, anytime. Premium A4 Quill Art Journals have a stylish hard cover with an elastic strap closure, so that you can keep your pages bound and secure. The black hard cover is understated and simple, making it look both elegant and professional. 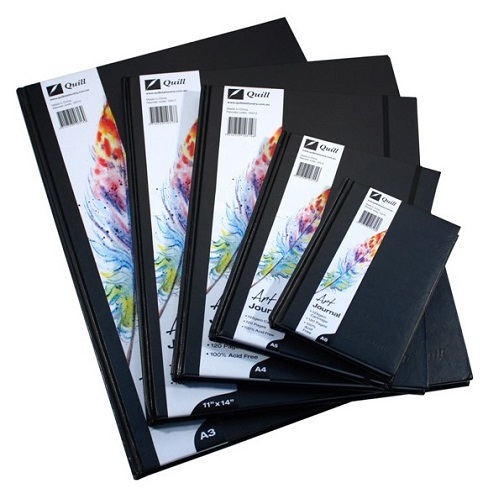 Complete with 120 pages (60 sheets) of 125 gsm 100% acid free cartridge paper to enhance your art and brighten your colours. Premium A5 Quill Art Journals have a stylish hard cover with an elastic strap closure, so that you can keep your pages bound and secure. Premium A6 Quill Art Journals have a stylish hard cover with an elastic strap closure, so that you can keep your pages bound and secure. Premium A3 Quill Art Journals have a stylish hard cover with an elastic strap closure, so that you can keep your pages bound and secure.